How do you use R to import, manage, visualize, and analyze real-world data? With this short, hands-on tutorial, you learn how to collect online data, massage it into a reasonable form, and work with it using R facilities to interact with web servers, parse HTML and XML, and more. Rather than use canned sample data, you'll plot and analyze current home foreclosure auctions in Philadelphia. This practical mashup exercise shows you how to access spatial data in several formats locally and over the Web to produce a map of home foreclosures. 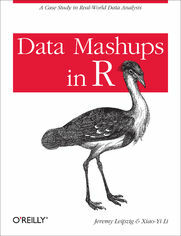 It's an excellent way to explore how the R environment works with R packages and performs statistical analysis.